Research on 3D human face recognition at LIVE is being conducted in collaboration with former Advanced Digital Imaging Research, LLC, Friendswood, TX. 1 S. Gupta, M. K. Markey, A. C. Bovik, "Anthropometric 3D Face Recognition", International Journal of Computer Vision, 2010, Volume 90, 3:331-349. 2 S. Gupta, K. R. Castleman, M. K. Markey, A. C. Bovik, "Texas 3D Face Recognition Database", IEEE Southwest Symposium on Image Analysis and Interpretation, May 2010, p 97-100, Austin, TX. 3 S. Gupta, K. R. Castleman, M. K. Markey, A. C. Bovik, "Texas 3D Face Recognition Database", URL: http://live.ece.utexas.edu/research/texas3dfr/index.htm. The database, along with ancillary data may be download freely here, and may be used without restriction for educational and research purposes, providing that our paper and this website are cited in any published work. The Texas 3D Face Recognition Database is intended for research and purposes only and may not be used for any commercial purposes. It is expected that access will be granted only to Project Managers and Principal Investigators of senior responsibility. In order to download the database, please fill out this form . Access instructions will be sent over e-mail. A pre-print of our paper describing this database is present along with the data. If you wish to obtain only the pre-print and do not need access to the dataset, please contact Dr. Shalini Gupta by sending her an email: shalini.gupta@ieee.org . 2 Gupta, S.; Castleman, K. R.; Markey, M. K.; Bovik, A. C., "Texas 3D Face Recognition Database," IEEE Southwest Symposium on Image Analysis & Interpretation, p. 97-100, 23-25 May 2010, Austin, TX. Briefly, the Texas 3D Face Recognition (Texas 3DFR) database is a collection of 1149 pairs of facial color and range images of 105 adult human subjects. These images were acquired using a stereo imaging system manufactured by 3Q Technologies (Atlanta, GA) at a very high spatial resolution of 0.32 mm along the x, y, and z dimensions. During each acquisition, the color and range images were captured simultaneously and thus the two are perfectly registered to each other (Figure 1). This large database of two 2D and 3D facial models was acquired at the company Advanced Digital Imaging Research (ADIR), LLC (Friendswood, TX), formerly a subsidiary of Iris International, Inc. (Chatsworth, CA), with assistance from research students and faculty from the Laboratory for Image and Video Engineering (LIVE) at The University of Texas at Austin. This project was sponsored by the Advanced Technology Program of the National Institute of Standards and Technology (NIST). For each face, is also available information about the subjects’ gender, ethnicity, facial expression, and the locations of a large number of (25) anthropometric facial fiducial points (Figure 2). 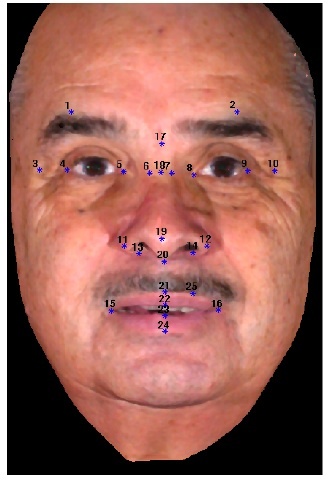 These fiducial points were located manually on the facial color images using a computer based graphical user interface. Specific data partitions (traning, gallery, and probe) that were employed previously to develop the Anthropometric 3D Face Recognition algorithm 1 at LIVE are also available. The role of the Texas 3D Face Recognition Database is complementary to other existing 3D facial databases. These include the Face Recognition Grand Challenge database ( http://www.frvt.org/FRGC/ ), the Bosphorus database ( http://bosphorus.ee.boun.edu.tr/ ) and the Binghampton 3D Facial Expression database ( http://www.cs.binghamton.edu/~lijun/Research/3DFE/3DFE_Analysis.html ). To aid researchers in focusing primarily on the development of face recognition algorithms, the facial data in Texas 3DFRD has been (a) pre-processed to remove extraneous non-facial data, and has been (b) normalized to a frontal pose and a standardized position (Figure 1 and Figure 2). The 3D facial data has been acquired using a fast stereo imaging system with perfectly registered 3D and 2D images, which unlike range imaging systems, can be practically deployed in airport screening applications. Texas 3DFRD was created to develop and test 3D face recognition algorithms intended to operate in environments with co-operative subjects, wherein, the faces are imaged in a relatively fixed position and distance from the camera. For algorithms intended for face recognition in less constrained settings, e.g., different distances, widely varying poses, poorly registered 3D and 2D data, etc., the Texas 3DFRD may be less representative as some of the other databases. However, the Texas 3DFRD is an ideal choice for comparing strictly the recognition performance of different face recognition algorithms, eliminating differences in preprocessing for registration, scaling, pose rectification. Numerous other features that of Texas 3DFRD that are complementary to the existing databases are detailed in the published article 2 . This web page is maintained by Dr. Shalini Gupta. Please email any further questions about the Texas 3D Face Recognition Database directly to her at shalini.gupta@ieee.org . Permission is hereby granted, without written agreement and without license or royalty fees, to use, copy, modify, and distribute this database (the images, the results and the source files) and its documentation for any purpose, provided that the copyright notice in its entirety appear in all copies of this database, and the original source of this database, Laboratory for Image and Video Engineering (LIVE, http://live.ece.utexas.edu) and Advanced Digital Imaging Research, LLC, Friendswood, TX, is acknowledged in any publication that reports research using this database. *S. Gupta, M. K. Markey, A. C. Bovik, "Anthropometric 3D Face Recognition", International Journal of Computer Vision, 2010, Volume 90, 3:331-349. *S. Gupta, K. R. Castleman, M. K. Markey, A. C. Bovik, "Texas 3D Face Recognition Database", IEEE Southwest Symposium on Image Analysis and Interpretation, May 2010, p 97-100, Austin, TX. *S. Gupta, K. R. Castleman, M. K. Markey, A. C. Bovik, "Texas 3D Face Recognition Database", URL: http://live.ece.utexas.edu/research/texas3dfr/index.htm.